Advertisers spent £476 million more on smartphone video ads in 2017, making it the fastest-growing online ad format, according to new research. The data comes from the latest Digital Adspend report by the Internet Advertising Bureau (IAB) UK and PwC. Video contributed heavily to the total amount spent across all smartphone advertising rising by 37.4% to £5.2bn. As a result, 45% of all digital ad spend went on smartphones – compared to just 9% five years ago. However, the IAB’s chief digital officer Tim Elkington noted “there’s still significant room for smartphones share to grow” as they accounted for 59% of online time¹ in the final quarter of 2017. 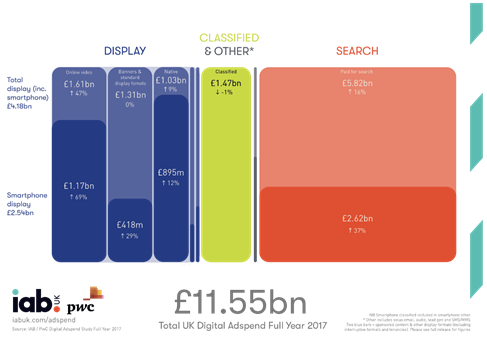 Overall, total digital ad spend increased 14.3% to £11.55bn. Accompanying online YouGov data produced specifically for the report reveals that in terms of online smartphone activities, listening to a podcast has seen the biggest rise amongst Smartphone users, with a ‘net’² rise in popularity of 30% followed by viewing social media ‘stories’ (up 29%), reading news articles (up 24%) and learning a new skill (up 22%).